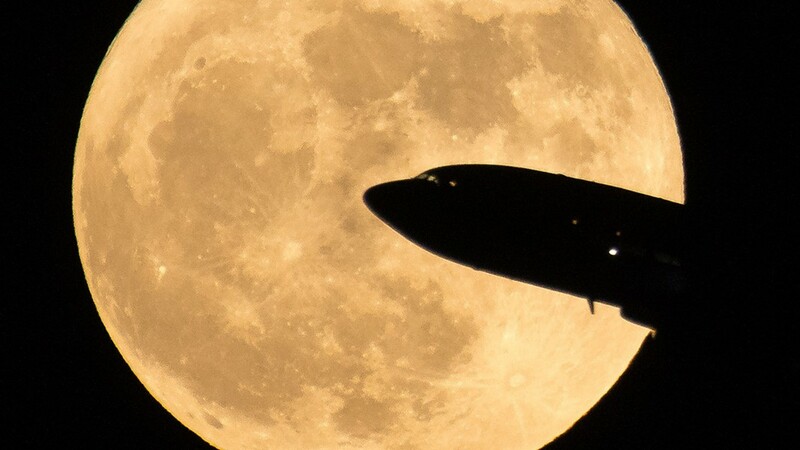 An aircraft taking off is seen passing in front of full moon in December of 2017. Move over Super Blood Wolf Moon, it’s the Super Snow Moon’s turn to shine. And, hey, it’s the second to the last one for the year, so enjoy. According to the website Time and Date, moonset in Eureka will occur at 7:22 a.m. Tuesday — with the full moon reached at 7: 53 a.m. — and rise at 6:17 p.m. The National Weather Service, however, forecasts rain is likely for that evening. A supermoon occurs when the moon’s orbit is closest (perigee) to Earth at the same time it is full. So what's so special about a supermoon? Turns out, it's a bit more subtle than it sounds—but for the interested observer, there's plenty to see and learn. The Moon orbits Earth in an ellipse, an oval that brings it closer to and farther from Earth as it goes around. The farthest point in this ellipse is called the apogee and is about 253,000 miles (405,500 kilometers) from Earth on average. When a full moon appears at perigee it is slightly brighter and larger than a regular full moon—and that's where we get a "supermoon. The term “supermoon” was coined in 1979 and is often used today to describe what astronomers would call a perigean (pear-ih-jee-un) full moon: a full moon occurring near or at the time when the Moon is at its closest point in its orbit around Earth. The term gives preference to the geometric alignment of Sun-Earth-Moon and allows the occurrence of perigee into a wider time period than the actual instant of perigee (up to about two weeks, which is almost half of the Moon’s orbit).